Email marketing autoresponders are the secret sauce to almost all effective digital marketing strategies. It enables you to communicate with customers on their terms by giving them the information they need when they need and where they want it (i.e. their inbox). Because this type of communication requires automation to succeed and to scale, there are all kinds of questions surrounding when it should be sent. When someone opts in for something you are offering such as a report, tool or whitepaper, they will be prompted for their email address. In this case, you need to send the automated email with the item you promised immediately. Don’t wait 24 hours to send them an email with the eBook that they want; make sure it’s in their inbox within a few minutes. The inbox is where the battle for your customers’ attention happens each and every day and you must strike while the iron is hot. The next step is to send additional follow-up emails after you have delivered what the customer has asked for. This email can be used to find out if they liked what you sent them, and it can be used to encourage them to check out what else you have to offer. This is where it gets tricky. You always want to send your follow-up emails based on the time that the person opted into receiving communication from you because it’s more likely to fit their schedule and lifestyle. The rule of thumb is to send the first follow-up email within four to 24 hours after someone opts in. 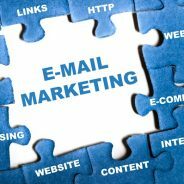 Need help with your email marketing campaign or marketing automation strategy? WSI OMS can help you. Contact us for more information today.